A solo show of recent drawings by Helen Jones, artist. Helen has been drawing dark, brooding and sublime weather scapes since 2010. 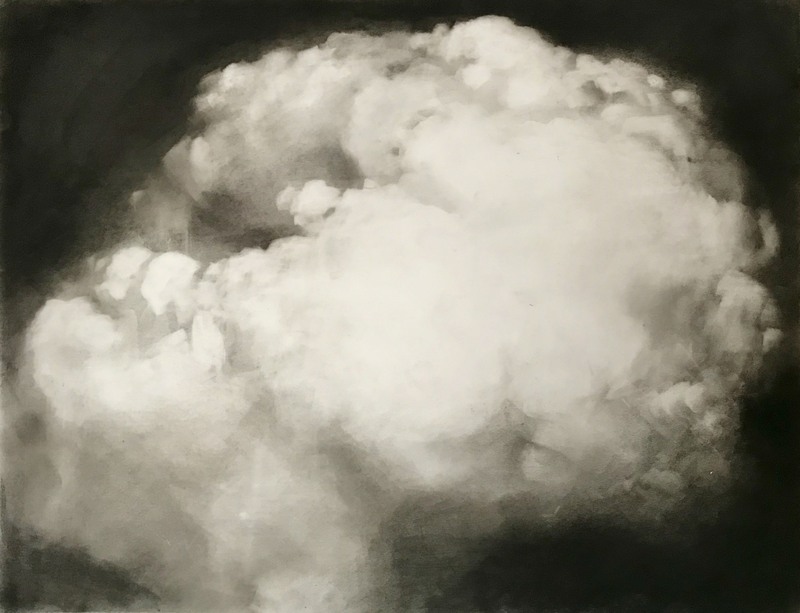 She begins by applying pastels to tracing paper, smoothing and smudging the marks with her hands, then removing the pigment with pencil erasers and abrasive materials. Helen does this over and over, to build up a complex and layered tonal image. Just as in the sky, the clouds emerge, fade, and are fluid within this process. Helen is drawn to the sky as somewhere to escape to and something to shelter from, an omnipresent and compelling force. ‘The elements can seem distant, but we feel them in our bones’. Helen feels that our environment, and in particular the weather, have a direct effect on our emotions and motivations, our hopefulness and despair, and our sense of our place in the world. We are uplifted or made anxious, soothed or terrified; our lives are made trivial in the path of the storm.